“Impressed”, the new exhibition at Lander Gallery in Truro which runs up to 27th April 2013 is an understated but lovely one. The environment is informal. The coffee shop is right across the way, so you can hear the hubbub as you walk around. This is comforting and it puts you at ease. I am not fond of closed private gallery spaces, I find them stifling and like something is expected of me more than just viewing. That is to say I feel I should feel or react a particular way. The Lander Gallery is the opposite of that. Though the gallery is open and light filled as you would expect from the mezzanine of a market, it is also intimate with areas sectioned off. This adds variety to the experience and allows you to be surprised by what’s around each corner. “Impressed” Printmakers and Ceramicists Exhibition at The Lander Gallery, Truro, UK from Matt Haselden on Vimeo. The exhibition was nicely broken up with ceramic and mixed media works, some on a fairly large scale. These complemented the flat works well and made for a nice flow through the space. 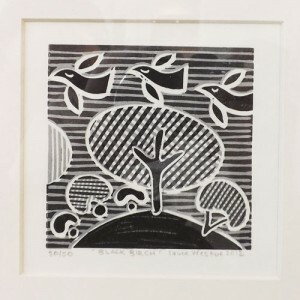 I was pleased to see a good representation of relief prints, with solid works from the likes of Isobel Ellis (lovely coloured reduction linocuts) and Laura Weston (primative style relief prints which reminded me of Breon O’Casey’s work. Laura, interestingly, uses vinyl as a matrix to carve. There were some very strong pieces from the etchers, John Howard and David Morris. The former showed wonderfully detailed drawings in acid and the latter soft velvety mezzotints of rich and evocative landscapes. 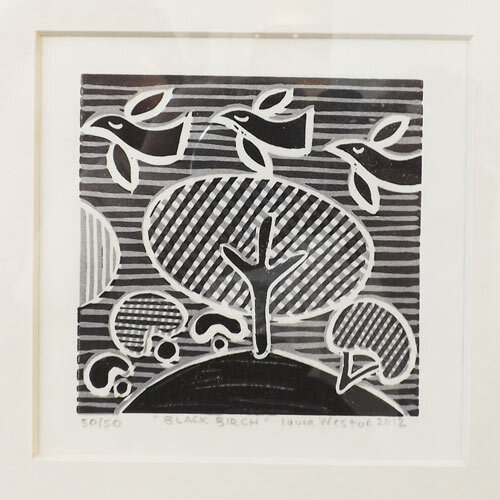 Felix Packer and Richard Lee Stevenson showed some solid expressive wood and linocuts which gave the exhibition a roundedness. So, if you are in Truro looking for a handmade print hit then head over to the Lander Gallery in Lemon Street Market for a visit, grab a coffee, and while you’re there pop downstairs to Illustrated Living for a look at the lovely prints on sale. UPDATE: Cath Wallace the curator of the exhibition kindly dropped me an email and corrected my saying that the ceramics in the exhibition were porcelain – in fact, a mixture of ceramics were on display including porcelain. In particular Linda Styles’ and Vicky Heard’s work are not porcelain. Thanks Cath.